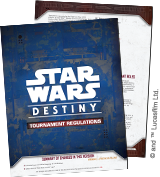 The latest version of the Star Wars™: Destiny Tournament Regulations is now online! This update contains the usual streamlined language, clarifications, and other minor changes that come with refining the rules. Download the new Tournament Regulations now to see all the changes for yourself! Players attending a Store Championship before July 26th can still find the previous Tournament Regulations on the Star Wars: Destiny page. 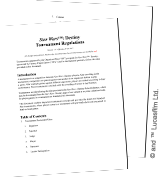 As always, other rules documents and support materials for Star Wars: Destiny can be found there as well.